Back in June I ranked the starterslike this: Fister, Roark, Zimmermann, Strass, Gonzales. Today I came across an article that took a different slant on this and ranked them this way FOR THE PLAYOFFS: Zimmermann, Fister, Strasburg, Gonzales, Roark. Very surprising! Rather than re-create the article, here is where to find it: http://www.sportsonearth.com/article/92089982 and the author is Anthony Castrovince. Easiest way to find it is to google the author and the date of the article: August 30. I’ll give you a hint as to why he ranks Roark 5th; he has already reached his career maximum innings workload of 159 1/3 innings. Castrovince makes a strong case that with a month to go before the playoffs, it is a serious stretch to expect Roark to maintain his impressive stuff and stamina into the playoffs. Check it out. Today MLB radio (‘Inside Pitch’ moderated by Jim Bowden and Casey Stern) ranked the Nats infield of LaRoche, Cabrera, Desmond and Rendon the game’s best. Some might remember Bowden used to be the Nats GM a few years ago. The Dodgers, Braves and Cardinals infields were also in the conversation. Masahiro Tanaka, Yankees pitcher, is flying back to New York today after the team said he had “general arm discomfort.” This could signal serious problems, since Tanaka has been shut down for several weeks with an elbow injury that usually ends up with Tommy John surgery. He began doing some throwing recently so presummably that is what has caused the team to take this action. Last night two replay calls went against the Nats. Both were correctly called by the onfield CREW CHIEF at 1B, Gary Cedarstrom, and then overturned by questionable analysis of the video replays. For a call to be overturned the videos must have convincing evidence that the original call was faulty. In NEITHER case was the evidence convincing! I saw the replays, as did FP and Carp. All 3 of us were shocked at both overturned calls! If the first replay had gone the Nats way, the Phillies would not have been allowed to contest the second one, and the Nats would have won the game! I have said this several times in several posts: Stephen Strassburg should not start a game in the playoffs. Why? Because he cannot command his fastball consistently. If you don’t believe me, then take a gander at Tom Boswell’s article on the subject in today’s Post. Anyone who watched Strass pitch yesterday should understand what I’m talking about. Fastball commands determines the effectiveness of all a starting pitcher’s repertoire of pitches. Strass has had this inconsistency his whole life; I watched him pitch in college. He gets hammered when he can’t spot his fastball, over, over and over again. OK, one more time for Nats fans: Strass should not be used as a starter in the playoffs. Fister, Roark and Zimmerman should be the starters. As the still very proud father of two former baseball players, one a girl and the other a boy, I feel compelled (for numerous reasons!) to say something about Mo’ne Davis. First, I wish her and her parents all the best, I’ve been “there.” I have watched her play baseball in the Little League World Series. She and her teammates did very well for themselves and I can see the team coaches have done a great job. I could see she was tired the other night, and knowing how much “media-pressure” she has been subjected to recently, I felt A LOT of compassion for her. Most of all I wish Sports Illustrated had NOT put her on its cover—that has always portended a rough future for the athlete (just ask Bryce Harper!). I hope Mo’ne does well in high school, both athletically and academically. And I hope she actually does achieve her dream of playing basketball at UConn:) I have many relatives up in Connecticut and all of them (as well as yours truly) are rabid UConn fans! Soriano Comes Through in the Clutch! Raphael Soriano came on in the 9th inning last night (8/20) to a tie game, after a few days well-earned rest. He pitched a 1,2,3 inning looking rested and his slider was back! He had good control again and the slider was beaking down as sharply as I’ve ever seen it. He obviously had worked on it since his recent troubles. He came in again tonight. Pitched almost as well as he did last night, though his slider was not as good. They won again in a walk-off so Sori was the winning pitcher again! I would not use him in more than two consecutive games. Manager Matt long ago challenged the team to win 10 in a row. If they do he promised to do a Ruth impersonation:) I’m looking forward to seeing this happen today, but first Gio has to pitch like he wants to win. THAT MEANS HE HAS TO DO WHAT GOOD PLAYERS DO——quiet their mind and body and focus on making good pitches (and NOTHING else)! I have to eat my words on Asdrubal Cabrera, since coming to the Nats he has shown me he can step up his game to where his new team is right now—-trying to get to the World Series. With his becoming a free agent at the end of this season, Rizzo will have to figure out how to make him an offer he can’t refuse, going forward. He and Desi have blended beautifully as they cover the middle infield, making some of the best DPs I have ever seen. Stephen Strassburg did what the team needed on Tuesday August 19, he went deep into the game, pitching 8 innings and giving the Nats a gift. I hope he learned from the experience. If I were managing the Nats, that game might have me considering giving him a start in the post-season. My inclination would still be to just use the “big three”—-Fister, Roark, JZimm as the playoff starters. After the game Sunday (August 17) I was livid over the team’s mismanagement of Raphael Soriano. Manager Matt sent him out to close his 4th game in the last 5 nights! It is too late in the season for this crap. That is too much for any closer! Williams ought to be thinking ahead to how he is going to use his excellent bullpen in the playoffs. He has 4 strong late-inning guys, each of whom is very capable of closing close games (as well as Aaron Barrett, who will be back soon and likely will be ready for some late-inning use too in the playoffs). The best way to use Sorriano, Clippard, Storen and Thornton is to start “mixing and matching” them in the 7th, 8th and 9th, closing with whomever has the “hot hand” and has been effective with the team they are playing that day. At this late date I would not even think of asking Barrett to close any games, but I’d not hesitate to use him in the 7th or 8th. 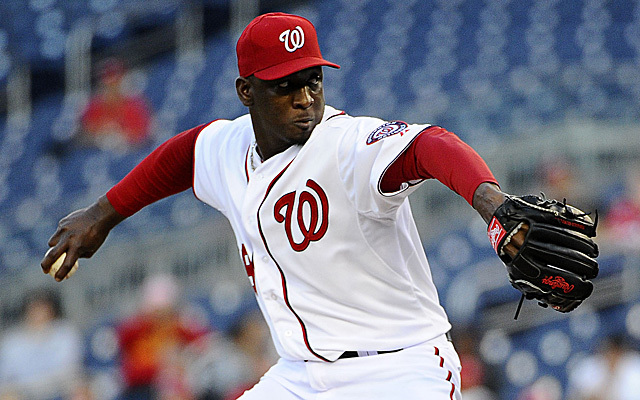 I’m pretty sure the Nats will make the playoffs, but they are not going to go far using just Soriano as the sole closer. As for the starting pitchers, Williams should stick to his big three, and limit Strass and Gio to spot starts when the big three need a rest. The playoffs are just for experienced ADULT players! Today I’d like to be Michael Taylor’s Father! What an inspiring game last night! In his first big-league game Taylor really made an impression: two hits, including a home run, and he looked very good in Right Field too, making a good throw from the deep corner to 2B, preventing the batter from stretching a single into a double. And after the game he was refreshingly humble in dealing with the media. I first mentioned how good Mike looked in Spring Training in an early blogpost on March 1. After ST he made the jump from A to AA. He did so well there he jumped to AAA 2-3 weeks ago, and then up to the parent team the day before yesterday. That’s quite an elevator ride! Doug Fister, the nats true ACE, also inspired last night! And Asdrubal Cabrera is steadily raising his batting average; it’s at .286 now. The Nats can likely get to the playoffs without RZimm, and Werth may see limited playing time while his shoulder heals (or NOT), but they need both of their clutch hitters/players in the playoffs! Read the Boswell article in today’s Post if you haven’t already!